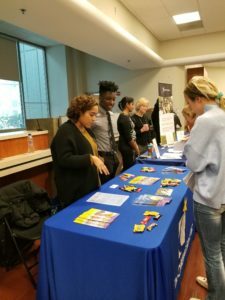 This week, The Emmes Corporation hosted their first Service Fair for employees. 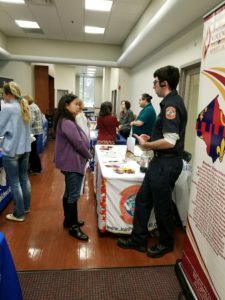 The event was hosted by the Emmes Cares Committee and featured 12 nonprofit organizations for employees to explore and consider serving through volunteerism. 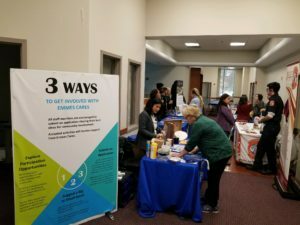 Emmes team members were invited to visit the fair between 11:00 am – 1:00 PM to talk with the nonprofits exhibiting, learn more about the Emmes Cares program from committee members, and receive some Emmes Cares branded swag as the program raises its profile within the company. Over the last year, Emmes has worked with Leadership Montgomery’s Corporate Volunteer Council program to build their Emmes Cares employee volunteer program which serves to broaden Emmes’ business mission to improve public health by making contributions to the community in which they live, work, employ, and serve. The Emmes Cares Committee champions, leads and supports volunteer activities for Emmes employees. All employees are encouraged to submit ideas for Emmes Cares activities or share their own volunteer activities and invite colleagues to join. Interested in starting or formalizing an employee volunteer program at your company? Contact Leadership Montgomery’s Director, Corporate Engagement Programs, Sarah Burnett at 301-881-3333 or sarah.burnett@leadermont.org.